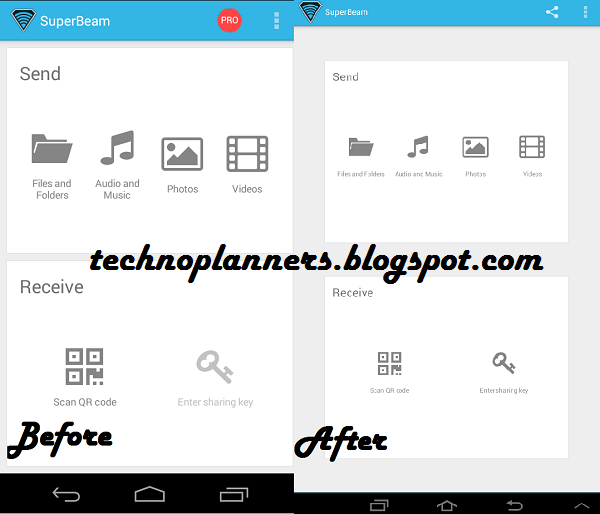 Today I am going to show how to Remove ads and Upgrade in pro version of SuperBeam for free but its only worked on android phone and tablets. This review captured on My Samsung Galaxy Tab 2. After Your install Pro Version all Pro features are enable like Rid of annoying ads, Receive using Manual Sharing Key this is particular useful for device that do not have a camera feature, Now Easily sharing files with your laptop using SuperBeam app for PC, Change default save location to any folder or internal External storage, Send to more than one device at the same time without loosing current sharing task. Also You can send unlimited number of files to device that do not have SuperBeam with the ability to download them all as a zip archive and it will be automatic deactivate mobile data when sending to prevent sharing data connection with connected devices.